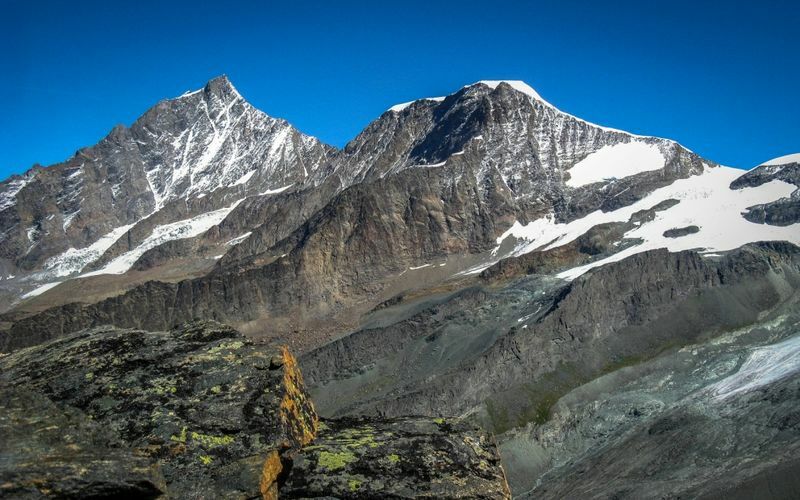 The Täschhorn belongs to the Mischabel group and is one of the most difficult 4,000-metre peaks to climb in Valais. The normal route (Mischabel ridge) is difficult, so this peak is rarely climbed. The Täschhorn is a three-sided pyramid. 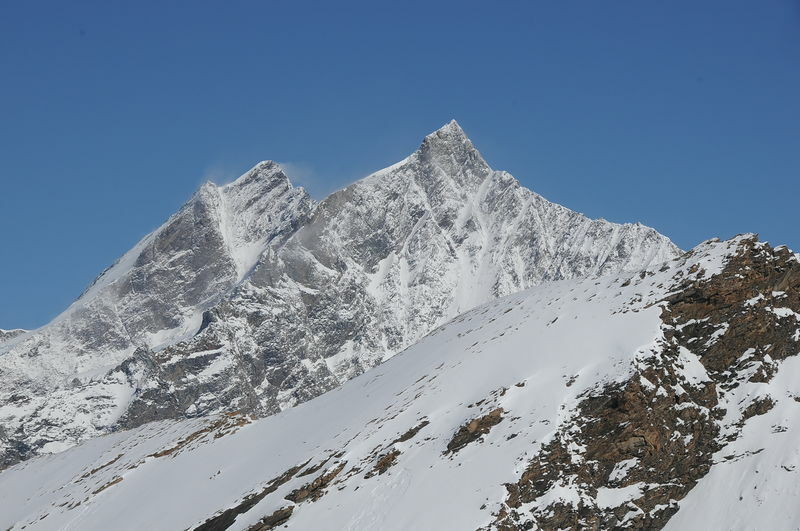 The east face rises above Saas-Fee, the west face above Täsch and the south face above Täschalp (Ottavan). The Täschhorn is named after the mountain village of Täsch, which lies at its feet. The Täschhorn is regarded as the uncrowned queen, even if the adjacent Dom is even higher. Three steep ridges and three rugged walls form a towering pyramid with bold geometry. 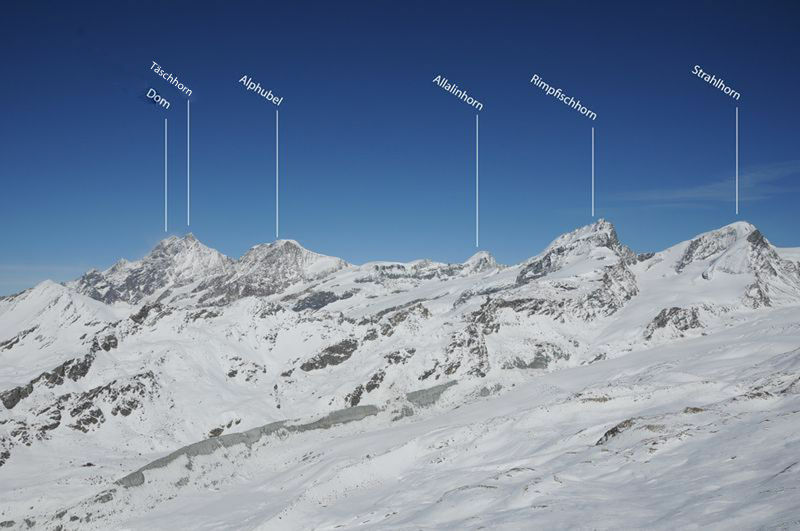 No wonder the Täschhorn is a giant among Alpine peaks. 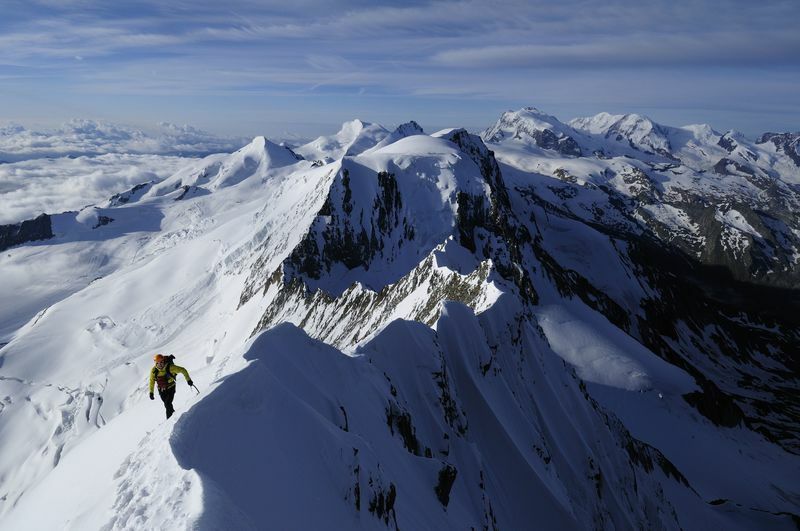 Its fearsome south face – though very rarely climbed – is considered one of the greatest and most dangerous challenges in the Alps. The legendary Franz Lochmatter was the first to climb it, at the age of just 19. Because of the steady rise in temperature in the Alps and the associated increase in the danger of falling rocks, it hardly figures in the repertoire of great climbs any more: it would be tempting fate. Although the Dom towers above the neighbouring Täschhorn by 55 metres, the latter has a much more powerful stature and dominates the whole Mischabel chain. All its routes are correspondingly long, and even when they are not too tricky, command great respect for their length alone – such as the route via the Teufelsgrat ridge. The ascent from the Dom hut via the north-west face used to be considered the normal route; however, it has lost much of its appeal. Today’s normal route is the more interesting and shorter climb along the south-east ridge from the Mischabeljoch bivouac.